The Oscars, or Academy Awards… the movie awards.. whatever you call them… were on last night. Maybe you didn’t see them because the 65 mph winds took out your electricity or maybe you watched it and PRAYED that a 65 mph wind would have taken out your electricity so that you didn’t have to search for the TV remote in your couch to change the channel. Thanks to the P-G, we knew that this snub was on weeks ago.. The Mr. Rogers documentary was kind of like the good looking guy/girl at work that everyone assumes must be dating because they’re so good looking… but they AIN’T. The Oscar voters, all assumed that “Won’t You Be My Neighbor” would be nominated by everyone else only to find out.. NOBODY nominated the film. Before I start to sound like a “homer,” hmmmmm.. wait.. before I start to sound like a Yinzer, here are some stats on the movie about MOST Pittsburgher’s favorite person in the entire world.. Mr. Rogers. “Won’t You Be My Neighbor” is the most-downloaded documentary in the history of streaming service FandangoNow. So go ahead Hollywood.. have your parties with fake body parts, smiles and poorly written award-ceremony jokes with no host. Go ahead with your silly muscle-man statue. 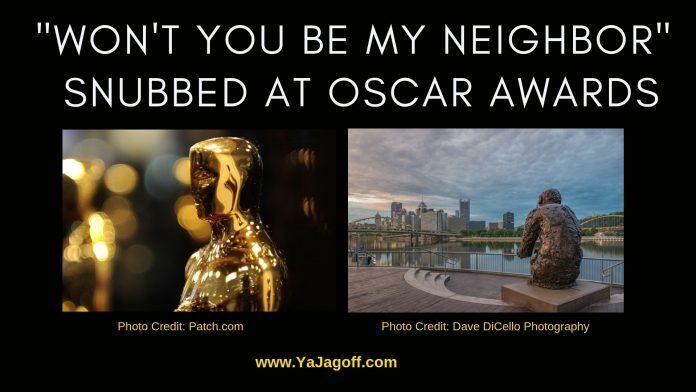 Go ahead and snub, not just the Mr. Rogers legacy… but all of Pittsburgh. The negative karma of this is kinda like stepping on at Terrible Towel so look out Ya Jag… oh wait… what would Mr. Rogers say about name-calling or being angry? “Forgiveness is a strange thing. It can sometimes be easier to forgive our enemies than our friends. So Academy Award voters.. we forgive you.. (but don’t snub Mr. Rogers in the future!) or you’ll get our Jean-Claude Van-Damme-Sudden-Death-Bruce-Willis-Striking-Distance-Tom-Cruise-Jack Reacher treatment! Next article#YaJagoffPodcast/ The Oscar Opportunity – Lights! Glamour! Action!